Last Friday night at our preshow lecture, director Kevin Kerr talked about the inspirations for his play Unity (1918), (including wonderful stories about his research process in his mother's hometown in Saskatchewan), the history of the play being produced by other companies, and his coming to the play as a director for the first time. An engaging lecture. Listen in now to the audio recording posted here. In the press: "A masterpiece by any measure"
They love us! It's not just our students who are falling in love with Unity (1918)! Read below to see Victoria's theatre reviewers fantastic reviews! "Who knew a play about the flu could be so moving? 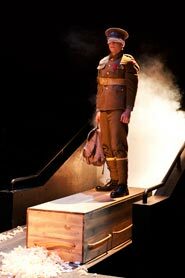 Unity (1918) is a minor classic of Canadian theatre... definitely worth seeing. 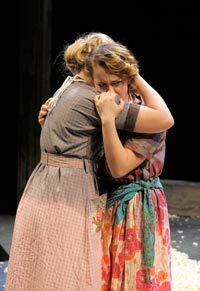 ... student cast does a superior job with a challenging script — the sisters are particularly convincing. The plight of the townsfolk is portrayed with great humanity and feeling. On Thursday night, at least one audience member dabbed her eyes and half the audience gave Unity (1918) a standing ovation. 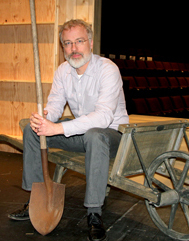 Read interview with Kevin Kerr and Adrian Chamberlain "A darkly humorous play about the flu" in the Times Colonist (March 13). "... two telephone operators — Doris and Rose — ...provide comic relief as the corpses begin to accumulate. Danielle Florence (shown left) and Marisa Nielsen manage the difficult task of blending comedy and tragedy with great sensitivity and tone. Staging (Allan Stichbury) is sombre and majestic in its simplicity. Running completely around the theatre, a canvas drop conveys the grandness of the stars in the prairie sky—an effect that is mirrored in the costumes (Halley Fulford) which are made to twinkle, at times, by lights set into the very fabric. A masterpiece by any measure, Unity 1918 is an ode to our human capacity to endure, and continue to dream, even among unimagined horror. 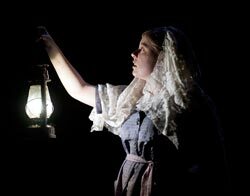 UVic's Phoenix Theatre ends the 2013/2014 season with a remarkable production and a fine tribute to our persevering ancestors. Read Janis La Couvée's full review on her blog. "It isn't terribly often you see a piece of theatre as the playwright intended it to be seen. Unity is a triumph. ...all of the performers involved... never appeared to be giving an ounce less than their best. The Phoenix should be proud; Unity can be held up to the best of what Victoria has to offer, even to professional companies whose tickets cost three times as much. It would be tragic for you to miss this. Read Drew May's full review at The Marble. ... It's a very strong play. I really liked the play. It's well designed by Allan Stichbury, who's designs are always very elegant and spare. ...the coffins are used for, well as coffins, as you can imagine, but also as benches and seats and beds... A simple set covered in wood shavings was quite effective." "The script itself is genius, detailed with lively dialogue and surprising scenes. 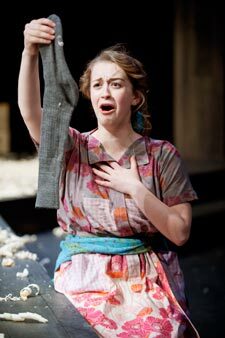 ... Sissy was played by Haley Garnett, who illuminated the stage with charisma and energy. 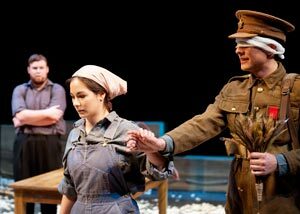 She was joined by the talented Amy Culliford as Beatrice and Logan Mitev, who played the blinded soldier Hart with subtlety and respect (shown left). 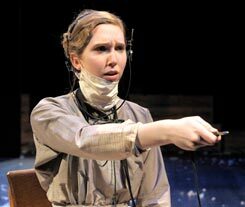 Marisa Nielson's expressive performance of telephone operator Rose contrasted with Keshia Palm's serious, demanding role as the Icelandic undertaker, Sunna. Both actresses achieved memorable performances. The Phoenix's thrust stage was strewn with wood shavings, which made for some interesting emphasis when dragged bodies left bare black strips in their wake... Live music was provided by a talented guitarist [Francis Melling], who used a warping pedal to imbue the sound with eeriness. 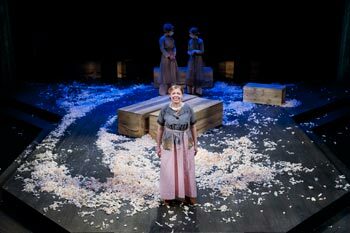 The Phoenix's production of Kerr's award-winning play did the university proud, and should not be missed by students and community members alike. Read Nadia Grutter's full review on the Coastal Spectator website. CVV Magazine: "Unity - You should go"
"...Kerr charms thanks to creative staging, a great score and too many outstanding performances to name. ... he has expertly woven dark humour (including a clever doomsday sub-plot) into the story for levity and this cast has comic timing to match. Telephone operators Doris (Danielle Florence) and Rose (Marisa Nielsen) steal every scene they're in with clever banter and precisely the shrill, patronizing delivery you'd expect from a town gossip worth her salt. 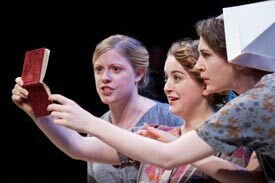 Protagonists Beatrice (Amy Culliford) and Sissy Wilde (Haley Garnett) (shown right) play their big and l'il sis archetypes with tremendous humanity, noble despite adversity yet played with just the right amount of pluck to keep them interesting. Colette Habel's precise sound design works with the transformative set to help us shift seamlessly through locations with something as simple as an annoying water drip. Unity (1918) is about so much more than just the flu. It's a look at the enduring struggle we all face in our ambition towards love and purpose and family; the Phoenix's production simply gives us an elegant, intuitive tool to better explore it. Read Melanie Tromp Hoover's full review here at CVVMagazine.com. (Posting may be delayed until later tonight). The Department of Theatre is hosting dance theatre performer Michael Sakamoto as part of our exchange program with Bangkok, Thailand. He will be performing two works, Gherm a dance theatre solo and Flash Mixtape, a duet with Waewdao Sirisook. The lighting designs for these works were created by student Imogen Wilson who, with other student Breanna Wise, is currently studying at the Bangkok University's Production and Design program. Free admission. All welcome. Check out your favourite scenes of Unity (1918) with the gallery of 45 photos on Facebook. Thanks again David Lowes at Arts Studio21 Photography for his amazing photography. Want to know more about we do? Follow us on Twitter too!